We are excited to announce we'll be having a marketplace at our Cookies + Champagne Party again this year! We've got a lineup of local artisans and entrepreneurs who will be showcasing and selling their products and services -- from jewellery to cosmetics to Likes! So show your support, bring some cash and get ready to shop! Dani G Inc. brings Canada the best in edgy marketing - comprised of The Like Button (a social media marketing team) and Tentacle Studio (graphic design and animation). The Like Button has worked and proven their social media skills with over 200 companies across Canada in the last 2 years, working with brands like Under Armour and The Asthma Society of Canada, and running networking parties featuring some of Toronto's hottest talent. Tentacle Studio is responsible for our success with Facebook covers, Twitter background, infographic videos and other videos by our animators who have worked on projects with Wendy's, Subway, BMO and Body Break. Dani, the owner, is proud to bring her innovative marketing ideas directly to her clients by staying involved and keeping things fun. Follow Dani on Twitter @daniginc and Facebook. LUX-SPA offers the ultimate in luxurious specialized treatments for hands and feet with unparalleled service and fastidious attention to hygiene. This award-winning "social spa" is suited for meeting friends or clients and it's also an excellent event venue. Check out the Winter Promos: "Tootsie Tuesdays" - book any Pedi and receive a complimentary Hand Polish Change or upgrade your Pedi to a hydra-LUX Pedi for only $10 more! "Waxy Wednesdays" - book any Pedi or Mani and receive a complimentary Brow or Lip Wax! Follow Cathy on Twitter @LuxSpa and Facebook. Inspire Cosmetics is a high quality affordable cosmetics line. Created by Ford Model, Wendy Crystal to bring insider tricks of the trade to everyday women. "I am dedicated to showing women the true beauty they possess." You don't need to be a pro to know that with Inspire, there are easy to select, simple application, vitamin enriched products that give you the flawless breathable skin you've always desired without the heavy foundations! We are the official cosmetics line for the Argo Cheerleaders! Desire to Inspire yourself and go from drab to fab in five!! Follow Wendy on Twitter @inspirecosmetic and Facebook. Arbonne's skin care products are based on botanical principles from its inception in 1980. The product line has since grown to include both inner and outer health and beauty products that are unparalleled in quality, safety, value, benefits and results! 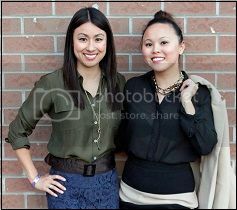 Follow Laura on Twitter @Arbonne_Canada and Facebook. A daily, fun, website dedicated to fashion that is manufactured in Canada. Samantha writes, styles, photographs and models fashion outfits, jewellery and makeup talents from right across the country. Along with her blog she loves chatting local fashion on television as she works with local networks all over Canada to spread the word! Strictly dedicated to these designers that bring so much more than fashion to the game, this website focuses on educating women about their fashion options that are trendy, affordable and most importantly Made in Canada. The Samantha Stylish booth will be raffling off beautiful garments and fashion products from designers right across the country, stop by to learn more on your Canadian-made options! Follow Samantha on Twitter @SamanthaStylish and Facebook. Share The Love and find the perfect gift for everyone and you! You can even launch your own fashion business as a stylist or simply invite your friends together and host your own Trunk Show at home or the office – it’s like having your own personal pop-up shop complete with a Stella & Dot Stylist. Follow Mirjana on Twitter @FashionMommieM and Facebook. Sterling Silver Jewellery that is simple and classic. Worn beautifully for all occasions. The designs are inspired by nature and most of the work is hand fabricated by artisan, Chak Man Chow. Follow Chak Man Chow on Facebook and Pinterest. Canadian-born designer Kristen Laborde’s jewellery reflects women’s desire for individuality. Drawing inspiration from diverse ethnic backgrounds to shape her style, she uses materials from all corners of the globe. Laborde creates fresh eclectic handmade jewellery that stands apart from the rest. Materials come together to shape dynamic and uniquely elegant arrangements. Her designs have appeared in the pages of publications such as Flare, Strut, Canadian Living, Zoomer, Toronto Star, National Post as well as Toronto Fashion Week runways, The Marilyn Denis Show and Breakfast Television. Notable personalities wearing Laborde Designs include: Divine Brown, Stacey McKenzie and Suzanne Boyd. Laborde creates strong pieces that can be worn in many ways. Jewellery as unique as the individual who wears it. Follow Kristen on Twitter @labordedesigns, Facebook and Pinterest. Fredrick Prince Jewellery’s new S/S 2013 collection The Forty-Niner Rush is reminiscent of the California coastline and carefree West Coast attitudes. Inspiration was pulled from the years of the first American gold rush which took place in the started in 1849. 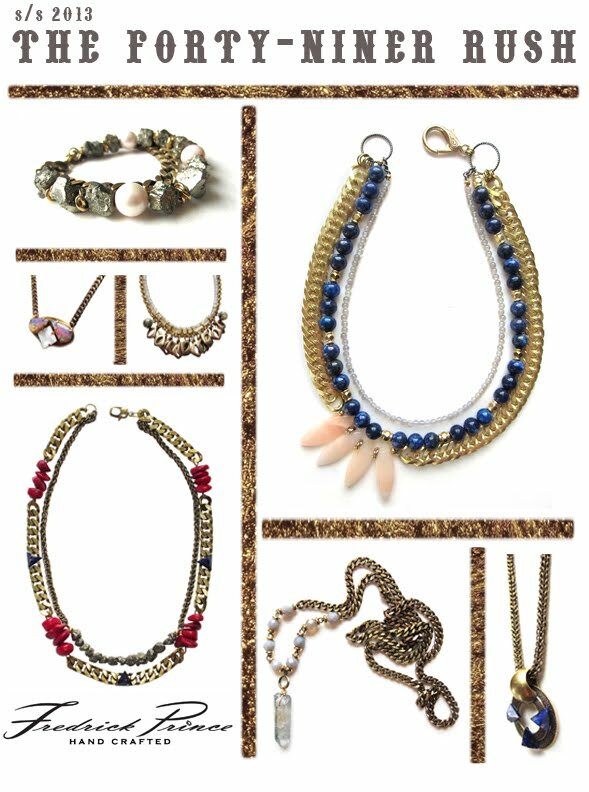 The collection is adorned with warm brass chains and semi-precious stones in cobalt, blush, coral and smokey grey. Follow Melissa on Twitter @fredrickprince, Facebook and Pinterest. Located in the heart of downtown Toronto our goal is to bring fun, foodie education and fabulous sweet treats to the city. Our classes include: Parisian macaron making, pie, cupcake & cake decorating, croissant, chocolate truffle, PA Day Fun, Mummy & Me and more! We create custom cakes, host bachelorette and bridal shower parties, corporate team building events, private birthday parties and take groups on our foodie trips to Paris! Le Dolci will delight you on the HUG evening with some icing sugar surprises! Follow Lisa on Twitter @ledolci, Facebook and Pinterest. Pita Break and Summer Fresh will be serving yummy and healthy snacks! Follow Ozery's Pita Break on Twitter. They make the best flatbreads and crackers that are tasty, nutritious and free of artificial preservatives. They pair perfectly with Summer Fresh's gourmet hummus and dips.